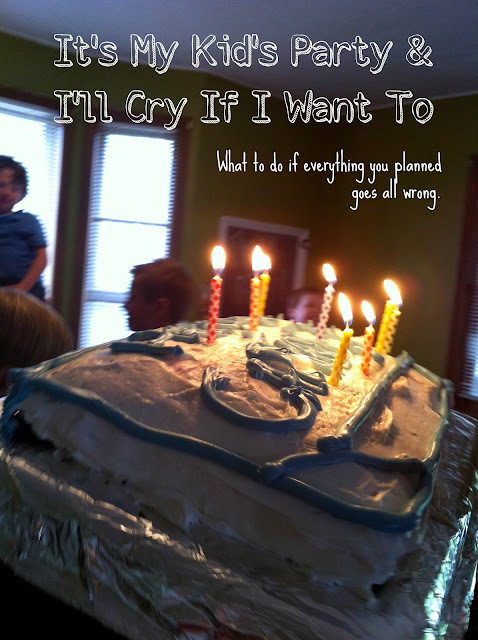 It's my kid's party and I'll cry if I want to. Yeah, it was that kind of party this weekend. The kind of party where it all went all kinds of wrong. The kind of party full of expectations and preparations and ultimately disappoint-ations, okay I know that's not a word, but it flowed so I went with it. The party was for JT. My son turned 7. I turned into a birthday party mother, a not so distant cousin of the stage mother. The mother who has to make a big deal about everything and it becomes more about her than the child. I turned into a mild version of some of those moms on reality shows that makes everyone feel better about themselves. It surprised me. I've always been a pretty laid back party planner and party goer. I enjoy parts of party planning, but really don't stress over too much. Maybe it's because life has been so hectic and I feel like we've been so scattered. Maybe it's because JT has never had a party with friends. Oh hell, maybe Pinterest made me do it. Seeing all those cute, over-the-top parties made me want to give a little piece of perfection to my middle child. So I came up with the perfect plan--a Pirate Party. And this was going to be a fabulous pirate party. There would be game stations, decorations, face painting, pirate certificates and more. And there would even be a pirate in the house named Cap'n Blood. Tim drew this awesome Pin the Patch on the Pirate poster. Actually, the kids had a pretty good time with this game. You gotta love the classics. Who wouldn't love all of this? Um, well, supposedly a group of 10 pretty sophisticated, hyper 6 and 7-year-olds. Sure my husband made a great pirate, but the boys simply weren't that into the whole pirate scene. 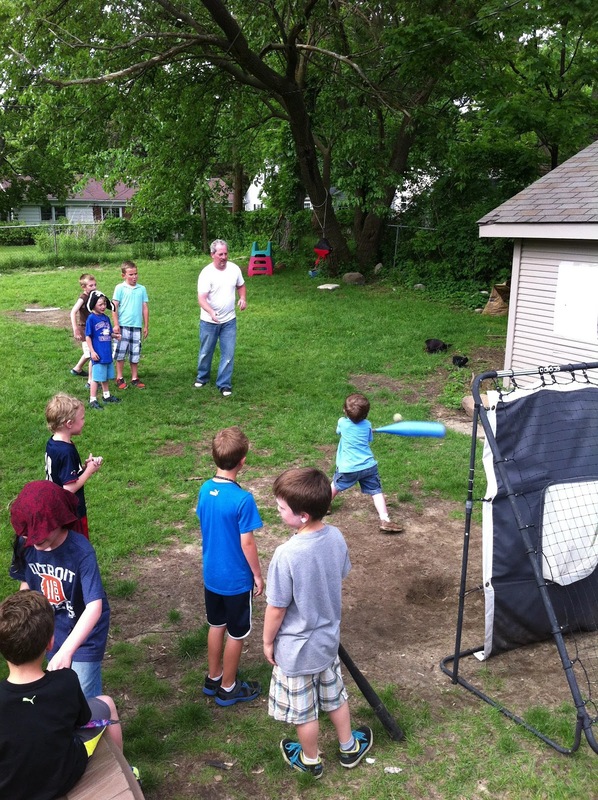 They wanted to play football and baseball and wrestle and yell and do what boys do. Tim took off his Cap'n Blood costume and pitched to the kids--he officially threw in the pirate towel. I was a little snappy with a couple of the kids (mine) and wondered how it all went so wrong and yeah, I may have cried just a little (probably from exhaustion from both party prep and just life in general). How could they not like pirates and games? what's wrong with kids these days? what's wrong with me? this party is the worst. what's wrong with my party planning? I should've volunteered more in the classroom and I would've known these kids didn't like parties. the kids hate this party. JT's day is ruined. waaaaaa. But guess what....even though my idea of a great party was totally unraveling (as well as my party planning/mom confidence), the boys were having a really good time. "This is the best party ever!," JT said to me. My first thought was "really? because I had so many other plans," but then I simply felt happy. Happy even though it may not have been what I chose for my son, it made him feel celebrated and loved. And that's what it's all about. There are lessons in this tale I tell. 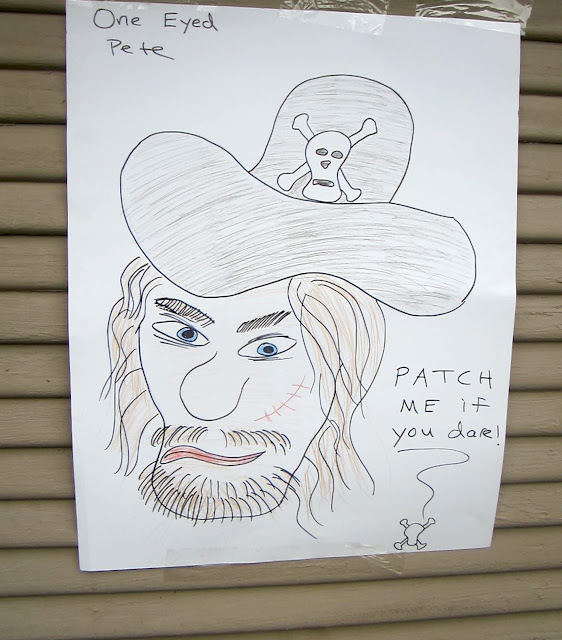 First, the lesson that kids are growing up fast these days, plan your pirate party early on at around age 3 or 4. Second, the lesson of acceptance. Accept that plans will go awry; people (usually your kids and their friends) won't like everything you do, even if you work really hard to make it happen; and it will be okay. Even if JT and his friends hadn't had fun, it still would have been okay. There's no perfect. You take the good, you take the bad, you take them both and there you have the facts of life. Just like the old sitcom theme song. You do your best, hope for the best and accept the results. Oh I forgot about lesson three, having a few drinks after a high-strung kid party is pretty much a brilliant move. Have plan, but go with the flow. Be willing to scrap the plan if no one is digging the theme. Don't become a Birthday Party Mom. Remember it's about the kids, not you. There are some people that really enjoy hostessing and that's cool. Those people are usually really good at, but even they can forget that a kid's birthday party is really, truly for the kid. Pinterest is for inspiration and ideas, not pressure and self-loathing. Don't take anything personally, ever, just don't. A kid says your house is ugly, who cares? I love to tell the story about how one time a child told me my house was the messiest house he'd ever seen. Ever. Whatever! Don't spend a fortune on a kid's birthday party, unless you have a disposable fortune laying around. All they want is to run around screaming with some friends for an hour and cake. Boom, you're done. Have your drink of choice at the ready after the party. Enjoy the moments when your kid is happy. It's your kid's party, you can indeed cry a little if you want to. Preferably not in front of the children of course. Even after knowing and putting into practice the nine other bullet points on this list, it is still okay to feel a little disappointed. But just make it quick and move on. Nope, they are not phased, not even sure if they remember the comment. I'm such a birthday party mom. I get so stressed out. Once in a while, I'll be like "screw it! This one's relaxed." But then my husband will sit in the yard and drink a beer with his dad while I'm trying to hang up balloons. Or something. Oh, but if you want to borrow my oldest sometime, he would TOTALLY love your pirate party.